The majority of articles about web development include code examples, and across the web we see great variation in how they’re formatted and presented. But a lot of them are not very good — because the code is badly formatted, hard to read, or can’t be copied-and-pasted without unwanted junk. So in this article I’d like to take a hard look at code examples, to investigate the common problems they have, and try to establish some best practice for how they should be done. 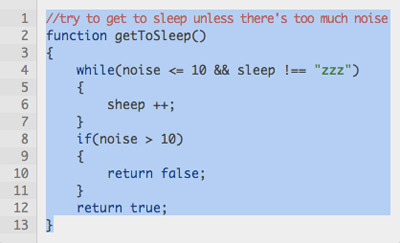 As we go along, you’ll inevitably notice how the code examples here at SitePoint don’t come up to scratch! This is one of the things we’ll be improving in the very near future. What Are Code Examples For? The first premise is all about how code examples are presented — they should be easy to read, and it should be obvious that they’re code. Yet if that was all that mattered, why not just have a picture? Indeed, it sometimes seems to me like that’s exactly how many sites regard their code examples, focusing on visual appearance to the detriment of their practical use. But code is not a picture, it’s important textual content, and that’s why the second premise is all about how code examples are implemented — it should be easy to copy-and-paste from them without loss of formatting, and without getting unwanted junk in the text. Code examples should also have good semantics, to give assistive technologies and robots the best chance of understanding them. Code examples should use good semantic markup. Tabs in code should not be converted to spaces. Code should have basic syntax highlighting. Code examples can have horizontal scrolling, but shouldn’t have vertical scrolling. Code examples should have line numbers, which are not included in text selection. Code examples should be editable. Now some of these principles might seem tricky to adhere to. It’s very common, for example, to see tabs being converted to groups of spaces, because most browsers render tabs at 8-characters wide. Equally common is wrapping each line in an <li> for the line numbers, but this of course means that the clipboard text will still include the numbers. What many sites do to compensate for these issues is to add a separate icon in the corner of the code block, which opens a popup-window with the original code, to copy-and-paste from. But I don’t consider that an acceptable solution — frankly, it’s irritating — and opening popups is never good for accessibility or usability. And it isn’t necessary anyway: as we’ll see, there are ways to implement all these requirements in a clean, accessible and usable way. Almost every code example I’ve seen uses the same basic elements — a combination of <pre> and <code> — which is a perfect choice. Since the <pre> preserves all white-space in its content, this will include anything between the <pre> and <code> tags, or between the <code> tags and the text, which is why they’re all run together. And finally, in HTML5 we can wrap a <figure> around the whole thing. The <figure> element was designed for marking-up things like diagrams, pictures and code examples, and can optionally have a caption using the <figcaption> element. We can also improve accessibility by adding some ARIA attributes — aria-labelledby on the <pre> which points to the <figcaption> (if there is one), and aria-describedby which points to the preceding text (if it describes the example). When a reader copies-and-pastes from a code example, the text should have the same formatting as you would use in an ordinary editor. Nobody sensible writes code with spaces instead of tabs, so code examples shouldn’t do this either. However a problem we find, as noted before, is that browsers render tabs which are 8-characters wide, and this is far more space than most people want. It also exacerbates the problem of having limited horizontal space (which we’ll look at later on). Some sites prefer 2-character tabs, though I think 4 is more readable, but it doesn’t make a huge difference either way. The point is that tabs should be tabs — how big they are is up to you. Of course browsers that don’t support this property will still render the tabs at their default size; this is unfortunate, but it’s better than replacing them with spaces. While we’re talking about white-space, I’d also say that empty lines should not be removed. We add empty lines to code for a reason — to create logical sections and to make it more readable — and the same is true for code examples. The point of syntax highlighting is to make the code easier to understand. The improvement can be significant, especially for beginners. This choice of elements might be contentious, and it certainly is quite restrictive — using <span> with different classes has far more scope, and if that’s the solution you prefer, I can’t tell you it’s wrong. But syntax highlighting doesn’t need to be all that extensive, it only needs to be enough to improve comprehension, and the advantage of using the elements I’m suggesting is that we still get basic highlighting even without CSS. Well actually, there’s another reason too — but I’m saving that for later! You’ll notice from the CSS that I’ve chosen to use <b> and <i> instead of <strong> and <em>, and this choice is also debatable. You could argue, for example, that it’s right to use <em> because it’s a kind of emphasis, but equally, you could argue that it’s right to use <i> because the difference is primarily visual. Personally, I tend towards the latter point of view. This is the opposite of how we treat pages as a whole, where horizontal scrolling is sorely avoided, but vertical scrolling is inevitable. And it’s precisely because we make pages this way, that code examples should do the opposite — because horizontal space is limited, but vertical space is not. Inner scrolling regions are generally not great for usability, because they’re harder to interact with, and can’t be controlled with the keyboard unless the element itself takes the focus. So we should treat horizontal scrolling as a fallback in case of long lines. In other words, it’s best to write example code in such a way as to avoid long lines, but if we then add overflow-x:auto we’ll be ready for cases where that’s not possible, or for when it’s viewed on a very small screen. I wouldn’t recommend the use of pre-wrap generally — because wrapping lines of code can make it much more difficult to understand — but if we don’t do that for print then the longest lines will be lost entirely. 5. Examples should have line numbers, which are not included in clipboard data. I think one would have great difficulty in justifying that semantically, but quite apart from that, the real problem there is that when the reader copies-and-pastes the code, its numbers are still included. Even if the numbers are implemented using CSS generated-content, some browsers will still include them in the clipboard data. I mentioned earlier how there’s a common solution to this problem, which is to add an icon in the corner of the code block, which opens a popup-window with the original code. And I’ve already dismissed that as a tedious and unacceptable solution! The boxes we need to create line numbers, showing how the number elements are entirely outside the code. The tricky bit is to keep the numbers in vertical sync with the lines of code. The first thing this implies is that we definitely can’t use pre-wrap formatting, because then we wouldn’t have a fixed link between the lines of code and the numbers. But the second and most important thing is that we must make sure all the elements use an identical font and line-height. But it also ties in with my general belief that generated content is not really content — because line numbers are not really content either, they’re presentation. The container <div> should also have aria-hidden, so that screenreaders won’t read the numbers; some screenreaders don’t read generated content anyway, but those that do would read them all at once and out of context, like it was one big number before the code. Code can be selected and copied without including the line numbers. And if any lines are long enough to trigger horizontal scrolling, the numbers won’t scroll with it — they’ll stay in the same position, keeping them visible all the time! There’s no particular reason why readers would want to edit code examples (unless you were making a code editor, but that’s something else entirely). You can click inside the code and use Ctrl+A to select it all. You can use Shift+Arrow to make partial text-selections with the keyboard. You can navigate internally using keys like Home and End. It’s now possible to scroll with the keyboard (as a consequence of navigation). This won’t affect our syntax highlighting since editable regions can still contain markup. In fact … you remember how I mentioned an extra compelling reason for using <b>, <i> and <u>? Well here’s the reason — because using these elements means the reader can edit the syntax highlighting themselves with native editor keystrokes — Ctrl+B, Ctrl+I and Ctrl+U. Of course, I’ve already said that we’re not building an editor here, so there’s no real reason why it’s important to have this control. It’s not important at all, it’s just a nice touch! So if you’d rather use <span> for syntax highlighting and not have these highlighting keystrokes, don’t let me persuade you otherwise. But the reason for using contenteditable is to provide additional selection and navigation controls — editable code examples have significantly improved usability and accessibility. Having a way to Select-All is reason enough by itself. And there we have it — six guiding principles for good code examples, which ensure they’re accessible, usable, semantically valid, easy to read, and easy to copy-and-paste from.